As a family owned company we have been providing Hawaii Volcano tours since 2010. 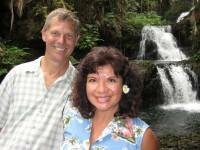 Big Island Aina Tours is a family owned and operated tour company. We do not hire drivers so you will have Tina or Gil as your guide.